Another staple item of the Phantasy Star series first appearing in Phantasy Star II is the Telepipe. The item's function was actually introduced in the previous game with another tool, the Transfer. When used, Transfers would magically whisk our heroes off to the last church used to save the game. 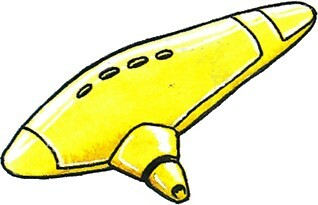 The first sequel renamed this item to Telepipe and altered the design, basing it on an ocarina, but retained the same transporting ability. The warping feature would be greatly refined in Phantasy Star IV with an ability to select a destination from a list of previously visited locations.